Election day finally arrives in just two weeks. Soon we won't have to hit the mute button so much when our children are around while we listen to the news. Soon we won't find the walk back from the mailbox quite so discouraging. But the damage of this election will last longer than just the next two weeks. 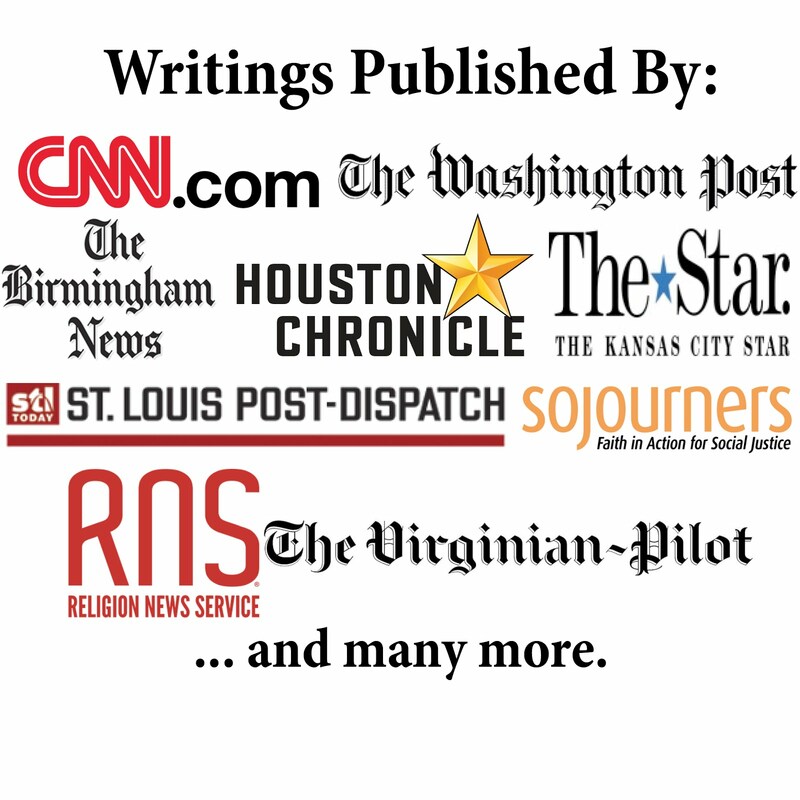 I wrote my book on faith and politics in the 2016 campaign (Vote Your Conscience: Party Must Not Trump Principles) in large part because I feared the partisan political efforts of many prominent Christian leaders was hurting our gospel witness. Although the book came out less than three months ago, the mess is much worse. Since then we've seen - and heard - more grotesque examples of Donald Trump's misogyny. And then we heard his Christian backers abandon their "character matters" and "focus on the family" mantras from the past and embrace him anyway. We are watching as many Christian leaders give away their moral credibility for a charlatan. And he's still probably going to lose. It's bad enough to sell your soul and profit the whole world, but it's even worse to sell it and still lose the election. How bad has this election been on our sense of morality? Consider new research from PRRI. They asked Americans if they believe "an elected official who commits an immoral act in their personal life can still behave ethically and fulfill their duties in their public and personal life." In 2011, white evangelicals were the least likely to believe that. 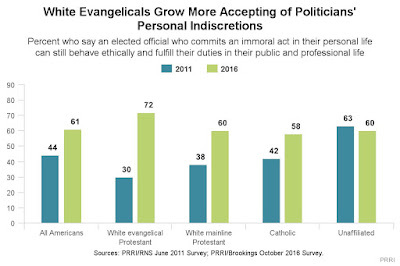 That means white evangelicals were the most likely to believe character matters and therefore wouldn't trust an immoral person in office. Now, white evangelicals are the most likely to see no problem. It's an amazing shift in just five years (and I suspect most of the shift came in the last year to justify backing Trump). Indiana Governor Mike Pence, Trump's running mate, recently accused his Democratic opponents of working to "demoralize" Republicans. Looking at the PRRI chart, it's seems obvious it's actually Trump who has done the de-moralizing. We are literally selling out, allowing party to trump politics as we redefine our spiritual values to fit our politics. Fortunately, there are a growing number of Christian leaders speaking out and urging a different way. I highlighted some positive voices in my book. New ones are now speaking out, including Christian leaders not known for talking about politicians and elections. But they recognize this election is hurting our gospel witness. So I will now highlight some of these new prophetic voices. * Author and HGTV star Jen Hatmaker offered a strong critique of "Trump's disqualifying and disgraceful comments" in the now-infamous Access Hollywood tape. She calls it "a national disgrace" that we have a candidate "normalizing sexual assault." She urges women to reject the suggestion they are "just a sexual object" and urges men to avoid becoming "depraved, sexual deviants caught up in disgraceful talk." She then offered a word on voting - and I particularly like her closing phrase. "Good voters, I want to remind you that you are not stuck or without options on election day. There are four names on the presidential ballot. You can vote your conscience." * Author Beth Moore offered a series of tweets also condemning Trump's sexual assault language. And she criticized Christian leaders making excuses for the language. Moore didn't specifically offer voting advice, but her critique of Trump was clear nonetheless. "Try to absorb how acceptable the disesteem and objectifying of women has been when some Christian leaders don't think it's that big a deal." * Students at Liberty University are speaking out against their president, Jerry Falwell, Jr., for continuing to support Trump in wake of the sexual assault tape. Some students started a petition against Trump, wrote an editorial for the student newspaper (which Falwell censored), and penned a Washington Post editorial. "Trump is the antithesis of our values; there is no reason to revisit his vices here. Most non-Christians recognize Trump as amoral and self-centered. If we ignore this fact and buy in to his promise of strength, what will it tell the world about how seriously we Christians esteem our values? ... We encourage everyone to take their conscience with them into the voting booth. Vote for your values, not against your fears." * Christianity Today, the flagship magazine for conservative evangelicals, published a strong rebuke of Trump (and of Hillary Clinton). The piece highlights a theme I developed in my book on how our allegiance to the Kingdom must trump that given to other kingdoms. The column proclaims about Trump that "there is hardly any public person in America today who has more exemplified the 'earthly nature' ('flesh' in the King James and the literal Greek) that Paul urges the Colossians to shed: 'sexual immorality, impurity, lust, evil desires, and greed, which is idolatry' (3:5)." To condone such behavior just to gain political power is also idolatry. "Strategy becomes idolatry, for ancient Israel and for us today, when we make alliances with those who seem to offer strength - the chariots of Egypt, the vassal kings of Rome - at the expense of our dependence on God who judges all nations, and in defiance of God's manifest concern for the stranger, the widow, the orphan, and the oppressed. Strategy becomes idolatry when we betray our deepest values in pursuit of earthly influence." I am thankful for the growing number of voices speaking out for principles over party because starting on November 9th we are going to need a lot of help repairing the damage from this election.